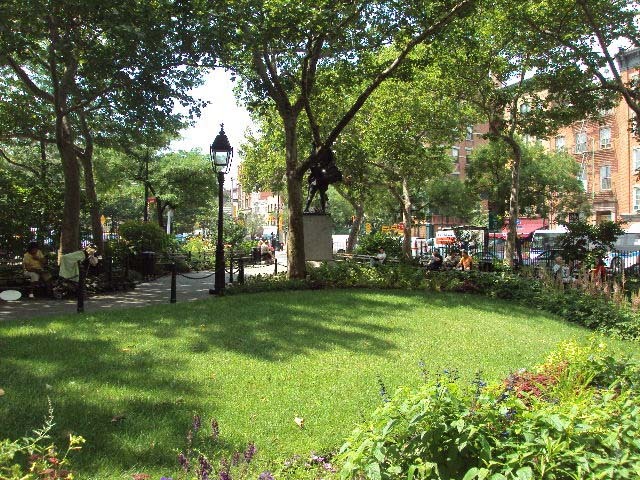 Abingdon Square Park shares its lineage with some of Greenwich Village’s earliest European landowners and social figures. Sir Peter Warren entered the British Navy as a volunteer in 1717 and rose to the rank of vice-admiral after an impressive tour of duty in such locales as the African coast, the Baltic Sea, the West Indies, and North America, where he fought in the French and Indian War. By 1744 he had purchased a three hundred acre farm in the area known as Greenwich—extending along the Hudson River from what is now Christopher Street north to about West 21st Street and bounded on the east by Minetta Brook and Bowery Lane (now Broadway). Sir Peter and his wife Susannah De Lancey lived in a manor house with a large formal garden in the area now bounded by West 4th, Bleecker, Charles, and Perry Streets. Their eldest daughter Charlotte married Willoughby Bertie, the Fourth Earl of Abingdon, and a share of the Warren estate was part of her dowry. 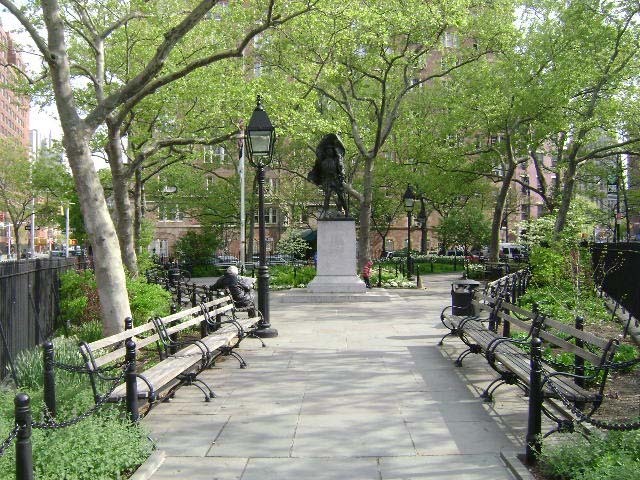 Her portion included the land that came to be known as Abingdon Square. In 1794 the City Council changed the designation of streets and places with British names in order to reflect American independence. Nonetheless, the name of Abingdon Square was preserved, because the Earl and his wife had sympathized with the American patriots, and he had argued in Parliament against British policy in the colonies. The Goodrich Plan of Manhattan drawn in 1827 depicts Abingdon Square as a trapezoidal parcel between Eighth Avenue and Bank, Hudson, and Troy (later West 12th) Streets. 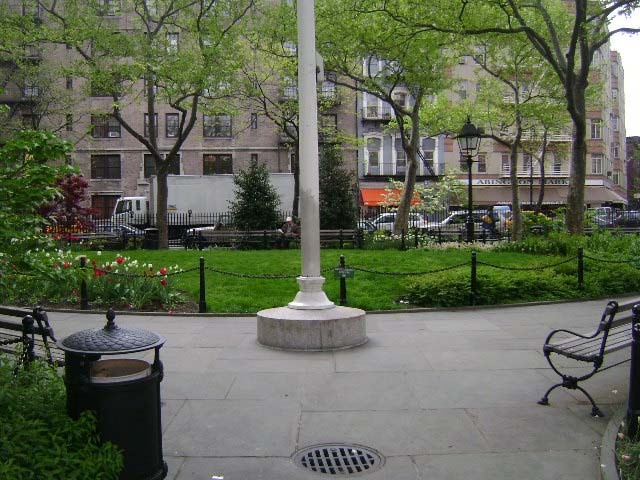 Nonetheless, school children planted a garden plot at Abingdon Square Park in 1913 and “took entire charge of the garden, raising the flower from seed.” In 1921, twenty thousand spectators gathered in and around the small park to hear former and future Governor Alfred E. Smith present the Abingdon Square Memorial (also known as the Abingdon Doughboy) in memory of local men who fought in World War I. Created by sculptor Philip Martiny, this monument was restored by Parks’ monument crew in 1993. The flagstaff was dedicated by the Private Michael J. Lynch Post No. 831 of the Veterans of Foreign Wars in 1933.